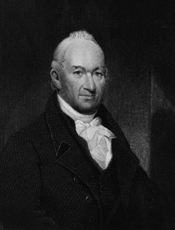 TALLMADGE, Benjamin, (father of Frederick Augustus Tallmadge), a Representative from Connecticut; born in Brookhaven, Long Island, N.Y., February 25, 1754; moved to Litchfield, Conn., in 1783; was graduated from Yale College in 1773; superintendent of Wethersfield High School 1773-1776; commissioned lieutenant in the Continental Line June 20, 1776; promoted to captain of dragoons December 15, 1776, major April 7, 1777, and colonel September 5, 1779; was appointed postmaster at Litchfield, Conn., in 1792; first president of the Phoenix Branch Bank; treasurer and later president of the Society of the Cincinnati; elected as a Federalist to the Seventh and to the seven succeeding Congresses (March 4, 1801-March 3, 1817); declined to be a candidate for renomination; engaged in mercantile pursuits and was an importer; also interested in banking; died in Litchfield, Conn., March 7, 1835; interment in the East Cemetery. Tallmadge, Benjamin. Memoir of Colonel Benjamin Tallmadge. New York: T. Holman book and printer, 1858. Reprint, edited by Henry Phelps Johnston, Gilliss Press, 1904.